Heading into their third Pac-12 matchup, the University of Utah football team (2-2 overall, 0-2 Pac-12) walked away victorious from their second consecutive road game in Palo Alto, California against Stanford University (4-1 overall, 2-0 Pac-12). Utah’s Zack Moss ran a 7-yard touchdown thrown by quarterback Tyler Huntley at the end of the first quarter. The extra point kick from Matt Gay was good, and Utah took the 7-0 lead. On Stanford’s second possession K.J. Costello attempted a pass to JJ Arcega-Whiteside, deep in the red zone but the pass was intercepted by Jaylon Johnson and ran back 100 yards for another Utah touchdown. The extra point from Gay was successful, putting the Utes up 14-0 with 10:50 left in the second quarter. “Don’t get caught. Just run hard,” Johnson said about his pick six. With his return, it became the longest interception for a touchdown against Stanford since 2005. The interception was also the first 100-yard pick six for Utah since Harold Lusk did the same thing against Colorado State in 1994. On the following Stanford possession, the Cardinals marched the ball down the field from their own 32-yard line to the Utah 14. On 3rd & 9 Costello threw his second interception of the night, this time the pass was intercepted by Utah’s Hauati Pututau and returned for 10 more yards. The Utes scored 7 more off the Stanford interception. Moss converted a 4 & 2 into a touchdown with 2:56 left in the first half, making the score 21-0. With 0:24 left in the first half, Stanford scored on a 2nd & goal at the Utah 2-yard line, on a run play by Trevor Speights. The Utes went into halftime on a high note as Matt Gay made a 48-yard field goal with 0:02 left on the clock to give the Utes a 24-7 lead. After receiving the kick off to start the second half, the Utes again utilized Gay to extend their lead. This time the kick was from 49 yards and gave Utah a 27-7 lead with 9:40 left in the 3rd quarter. Stanford responded with a powerful drive that ended in a 1-yard rush touchdown from Cameron Scarlet to narrow the gap with 5:02 left in the 3rd. After a disappointing drive for the Utes that lead to a punt from Mitch Wishnowsky, the Cardinals scored again off a 26-yard touchdown pass from Costello to Michael Wilson to make it 27-21 with 1:44 remaining in the 3rd. At the beginning of the fourth quarter, the Utes showed no signs of slowing down. Gay completed another field goal, this time from 34 yards out. The team kept their foot on the gas pedal with a score of 30-21. The next Utah score came from a 57-yard deep ball thrown from Huntley to Samson Nacua as the pocket collapsed. Gay tacked on the PAT to make it a two-possession game with 7:12 left in the game. On Stanford’s next possession after making it deep into Utah territory, Bradlee Anae knocked the ball loose from Costello leading to a fumble recovery by Corrion Ballard. On the first play after the fumble recovery, Moss punched the ball down the field for a 34-yard run, putting the Utes deep into Cardinal territory. While the drive didn’t end with the Utes seeing the end zone, Gay completed a 37-yard field goal making it a 40-21 game with 3:34 left in the game. With that field goal, Gay was perfect on the night in both field goals as well as PATs. 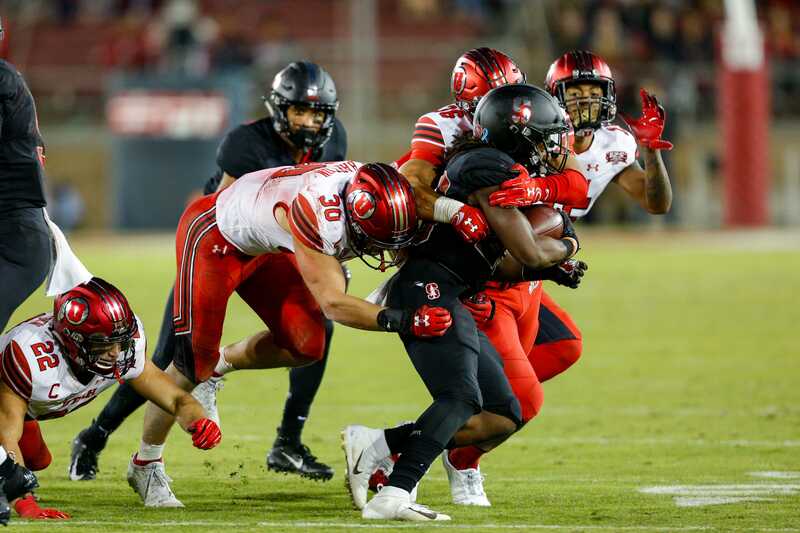 The game was sealed for the Utes when Javelin Guidry stripped Stanford’s Trenton Irwin to give the Utes the ball back on the Utah 34-yard line with 1:21 left in the game. Moss ended the game with over 100 yards for the second week in a row. “I think we’re on track to becoming as good as we can be. This team is the most talented I’ve seen, and it’s just a matter of putting things together, and it’s a matter of finishing,” said Britain Covey, wide receiver for the Utes. Whittingham believes the team that played tonight needs to be the team that shows up next week when the team faces their first Pac-12 South opponent of the season in their own stadium. “We need to be that team next week. We need to practice the same way, and play well next week,” he said. Utah will be back at home for the first time in over a month next Friday, Oct. 12 at 8 pm to take on the University of Arizona. 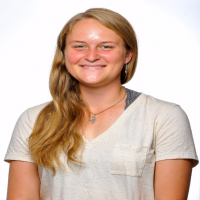 Great Article by Casey Overfield! Go Utes!